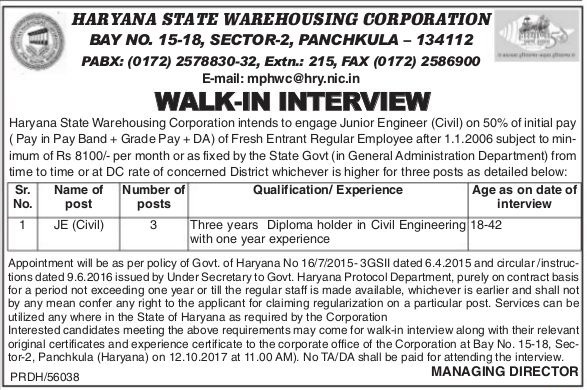 Haryana State Warehousing Corporation has disseminated a job notification as HWC Recruitment. Organization is inviting application form from well talented and capable contenders to fill up the vacancy of 03 Junior Engineer Jobs by attending Walkin interview on (12th October 2017). Qualification Requirement: Applying candidates should possess Diploma (Civil Engineering) from well recognized Board/ University/ Institute as per post wise eligibility criteria. The age of candidates for the above mention posts should not be more than 18 to 42 Years As on 12-10-2017. Salary Details: Selected applicants will get the salary of Rs. 8100/- Per month. How to Apply for HWC Vacancy? 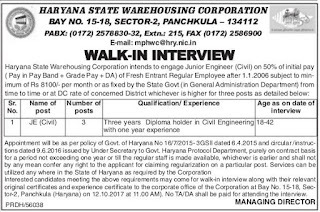 Willing and interested contenders who want to apply need to fill all the mandatory details in the application form & Enclosed it with all necessary certificates/documents and attend walkin interview to the address which mention below on 12th October 2017. Walk In Date : 12-10-2017.